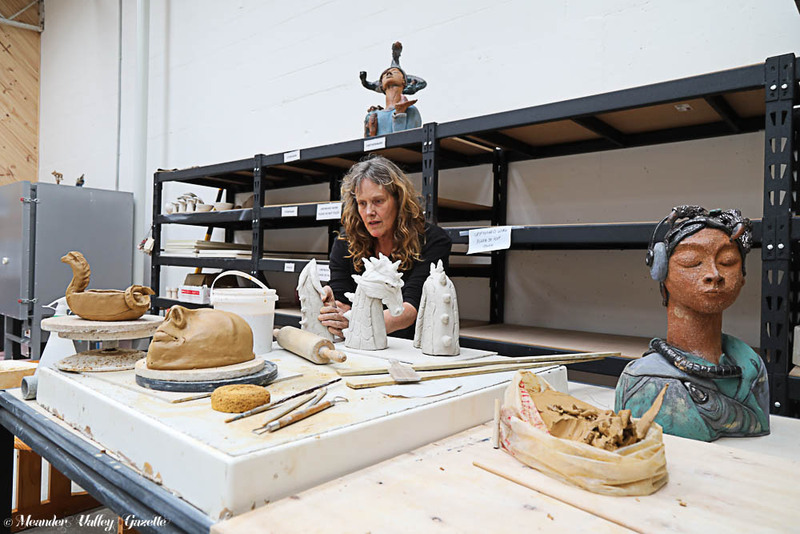 A pottery hub has been developed at Deloraine Creative Studios thanks to a Tasmanian Community Fund grant, Denis Durham and the Meander Valley Council. Pictured is Trish Richers, the Pottery Hub Co-ordinator. IT IS with great excitement that Deloraine Creative Studios (DCS) is announcing the completion and availability of our Pottery Hub. After 18 months of tireless work by the DCS executive committee President Sonja Grodski, Vice President Rod Russell-Stone and Treasurer Tracy Rolph, the vision of the Pottery Hub has come to fruition. This would not have been possible without the support and backing of Mr Dennis Durham and the Tasmanian Community Fund. Mr Durham had the faith in the quality of our studios to finance the renovation and remodelling of the area into a beautiful space to house the Pottery Hub. The executive committee applied successfully for a grant from the Tasmanian Community Fund for the purchase of a large kiln and associated furbishing. The Tasmanian Community Fund is an independent organisation that supports and strengthens Tasmanian communities by distributing funds to these communities. The Meander Valley Council also provided a grant to enable DCS to acquire the extensive industrial shelving, benches and cupboards required for the Pottery Hub. With the above support DCS will now forge ahead to facilitate and administer access to the valuable local Deloraine and North-west district resource. The Pottery Hub, located at 59-61 Emu Bay Rd Deloraine is a dynamic resource for the local and wider northwest Tasmanian community. It is available to both groups and individuals and is a space in which to share knowledge, acquire new skills and nurture creativity while interacting with a variety of potters and ceramicists, skilled and beginner alike. Trish Richers is the Pottery Hub co-ordinator. Information and bookings for space, firings and classes is available by contacting her on 0407 930 342 or trish.richers@gmail.com. Beginner pottery classes in hand building will commence on Saturday 9th February. Members of the public are welcome to come and view the Pottery Hub area during DCS opening hours and to discuss how the Hub can help them fulfil their creative ambitions.